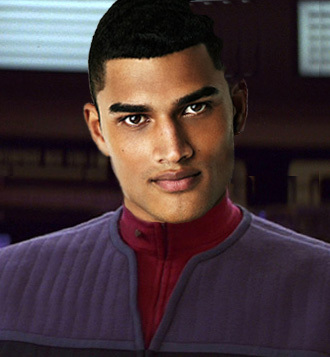 Lieutenant Junior Grade Brayden Jorey, a Betazoid is the Chief Helm Officer at the USS Tiger A. His skill and quick reactions at the helm has seen him rise to the rank of Lieutenant Junior Grade and though his career is young he shows much promise. Even before Jorey graduated from StarFleet Academy he excelled academically, scoring in the top 5 of his class. Athletically he did very well and clearly loves to look after himself physically and mentally. Jorey was Captain of the Velocity team, leading them to victory in his last two years at the academy. He was also a top scoring striker in the Academy Soccer league. Another unique opportunity he has was to be able to participate in a Klingon Bat’leth competition on Forcas III. He had learned his skill with the weapon from Koroth who is an important figure in his life, and is one of few non-Klingons to be awarded Champion standing. Jorey’s first mission outside of the Academy saw him arriving at his assignment, the USS Tiger A only to be trapped with fellow crewmembers in a nightmarish world of their minds own making. The ship’s counsellor had to treat him later for a unique for of post-traumatic stress disorder. His next mission saw him on an unexplored planet in the Hermates Sector, helping with the recovery of a century old Federation shuttle which had begun to emit a signal from its distress beacon. Things soon got out of control when a FTU ship was discovered and then destroyed by another unknown ship. A StarFleet Officer along with individuals rescued from the FTU before its destruction caused Havok aboard the USS Tiger A before eventually making off with some of its technology. 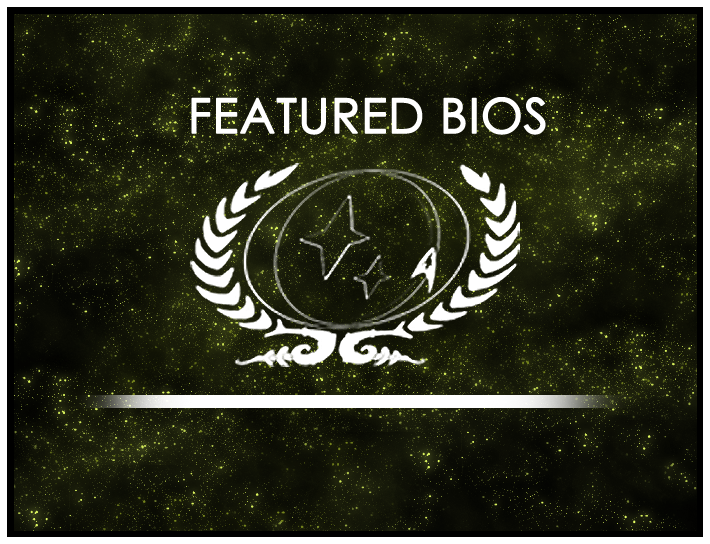 Lieutenant Junior Grade Brayden Jorey’s bio will be displayed on the wiki’s front page for the month of July. As always, you can find out more about the contest at its wiki page or in its forum. Round 14 is now open, so be sure to drop by and submit your own nominations!